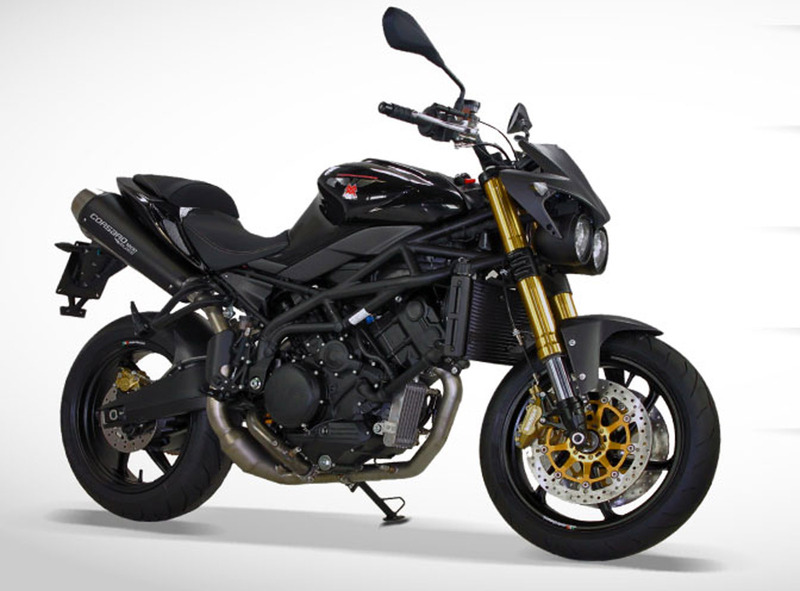 Exhaust Sport Termignoni with double silencer, 3-way catalytic converter and oxygen sensor. Euro 3. Naked and aggressive, Corsaro 1200 Veloce is a motorcycle with top-flight components and racing graphics. intended for bikers, who love Italian motorcycling tradition. The Corsaro 1200 Veloce is a “standard produced special bike”, a motorcycle born to deliver total fun and absolute performance worthy of a true racing machine. The technological core of the Corsaro 1200 Veloce is the Bialbero CorsaCorta 1187 cc twin cylinder engine, which develops 140 hp at 8500 rpm. The engine’s layout is compact, strongly characterised by the 87° V layout of the cylinders. The function of the frame is aided by top-notch suspensions which are even more sophisticated in this sport version. At front is a powerful Marzocchi Magnum with 50 mm diameter legs with precise customisation of the setting in compression and rebound thanks to a double adjustment: the adjuster on the plug for the hydraulic damping of the rebound is complemented by an adjuster for the hydraulic damping of the compression placed at the foot of the fork. The positioning of the scraper on the bushes improves the hold of the cartridge, the hard anodized internal rod in ergal makes sliding more efficient and assures a greater resistance to wear. The longer counterspring intensifies the thrill when pulling out of a curve at high speed and guarantees better stability at the front. On the whole, the visual solidity is echoed in a solid and even ride, with the bike ready to conform to the slightest unevenness on the road and to bear the thrust of deceleration in the most race-inspired breakaways. The rear is characterised by an asymmetrical swing arm that conceals a Sachs fully adjustable single shock absorber, with leg increased by 16 mm in diameter, adjustable spring in rebound with single ring nut and internal counterspring for improving riding response. While braking, the Corsaro 1200 Veloce never gives reason to disappoint: the Gold Series Brembo systems deliver powerful yet progressive deceleration, granting the rider the sensitivity needed for optimum handling of this difficult aspect of the riding experience. The exhaust system has two slender and lightweight Termignoni silencers in a pure racing style that produce a powerful hum while complying to Euro 3 emission standards. The second control unit with racing mapping delivered with the bike and that promises a definite upgrade in performance. This sophisticated electronic component can be utilized only for track use. The support of the rider footpegs is in ergal machined from the solid and they have been set more towards the rear to offer better control at the front, thus a racier feel. 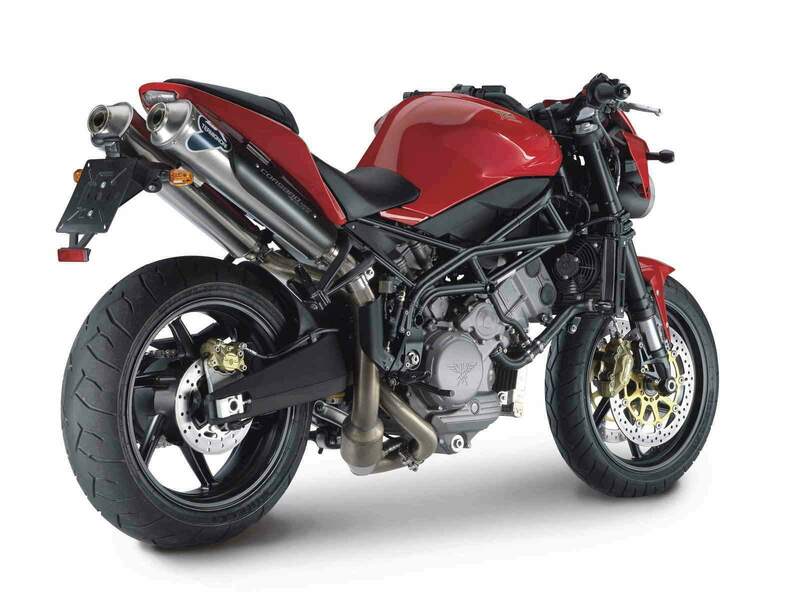 The Corsaro 1200 Veloce flaunts its gritty style aesthetically, too, which comes through in its “mean” graphics: the black technical base and monochromatic upperstructures in red accentuate the sporty character. 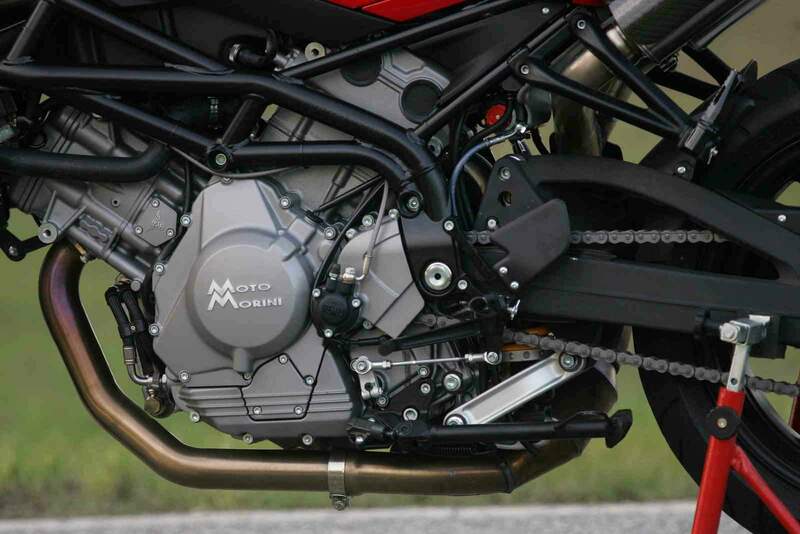 The bike will be available at the Moto Morini sales network starting from the end of 2006.